Vagabond Cheese Company will be set up with our cut-to-order cheese counter at the Historic Core Farmers Market in Downtown Los Angeles every Sunday. Located on 5th St. between Spring St & Broadway. 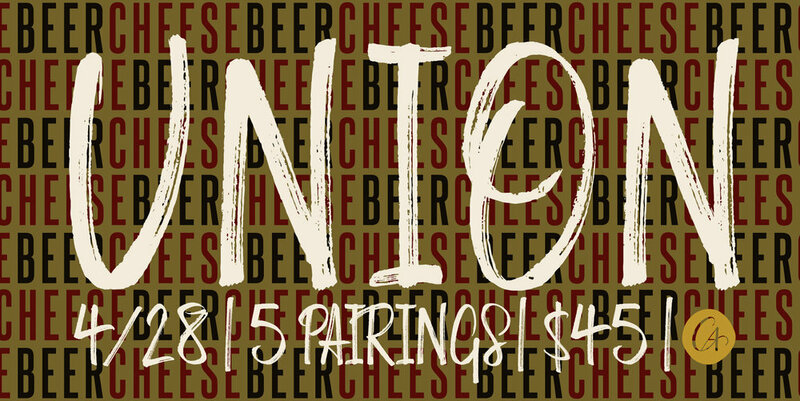 Join us for paired beer & cheese flights at the Bruery Terreux Tasting Room! Crafting farmhouse-style ales and sours, Bruery Terreux is The Bruery's wild-child. They're just as psyched about experimentation and just as devoted to all things that taste good as we are here at Vagabond Cheese. So it's a natural evolution for us to be joining them in curating a delicious cheese and beer flight event at the Bruery Terreux Taproom! Vagabond Cheese Company will be serving cheese & charcuterie plates at Scholb Premium Ales on the third Saturday of each month! Drop by any time between 5 and 10 PM! South Bay, here we come! The first Saturday of each month, you can find us at El Segundo Brewing Company for our monthly pairing event. We feature their tasty brews and a delicious cheese selection that will have you coming back month after month to see what new pairings we've found! Beer and Cheese are magical together. They've evolved side-by-side into thousands of styles, but how can you navigate the cheese and beer landscape, let alone know which ones will be a great combination? Join us at Angel City Brewery to find out! We'll guide you through the foundations of what differentiates styles, and teach you the basics of how beer and cheese are made. This class will include a tasting of five different styles of each. We'll help you to understand how to think about pairing beer and cheese together and give you tips on buying and serving them to give you the tools you need adventure on your own. This class requires a reservation, and is expected to sell out. oin us for a Saturday afternoon of Wine & Cheese pairings with Vagabond Cheese Company, Hoi Polloi Winery and Pagter Brothers Winery at the Double Trouble Wine Room in Downtown Newhall. Come join Alex Ourieff of Vagabond Cheese Company and Kara Potthast CS, of Epic Wines and Spirits for an intimate night of wine and cheese tasting, as they walk you through four specially curated pairings.